Premise: When an accountant goes in to audit a robotics company, he discovers that some missing money is part of a bigger conspiracy. About: This script finished low on last year's Black List. 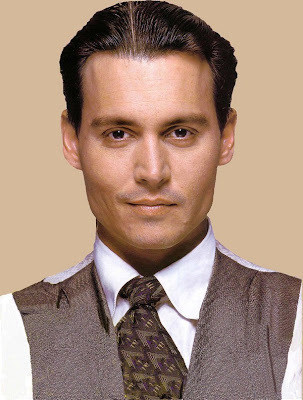 Mr. Depp as an autistic accountant? That's me "hmmmming." Because I don't know what to say right now. I mean I know I read a script titled "The Acccountant," but I'm not quite sure what it was about. First of all, the premise sounds pretty cool, right? The auditing of a robotics company leads to a bigger conspiracy? I mean the possibilities there are endless. However, just like a lot of strange things going on in The Accountant, the choice to go with "robotics" as the audited company has nothing to do with anything. This could be a toy company. It could be a computer company. It could be a company that manufactures sunscreen. What the company does has nothing to do with the story (or I should say, very little). That's not good writing. But that's not the only funky un-fresh decision being made here. The lead character, a man named Chris, is autistic. Cool right? Seems like you could go a lot of ways with that. But once again, the protag being autistic has nothing to do with anything. It's just a nice little character quirk. If you're going to make your hero autistic, well then dammit that better be integrated into every aspect of the plot. Unfortunately, that's not the case. I don't see this story changing at all if, for example, Chris is just anti-social. But I'm getting ahead of myself. Let's dust off that copy of Excel and see if we can't break down the odd plot for The Accountant, shall we? 30 year old Chris Wolff is one of the best accountants in the world. Oh, and he isn't afraid of sketchy clientele either. This guy will audit Bulgarian crime lords if it brings in the dough. Chris also has Asperger's, a severe form of autism that makes it impossible for him to have any sort of social relationships. I mean even the girl with the dragon tattoo would be like, "Dude, lighten up." Oh, and he also moonlights as a hit man. But we'll get into that later. So Chris is brought in to look at the books for this big Robotics company that's run by a Steve Jobs type and his sister. A young bookkeeper named Dana discovered some anomalies in the books a few weeks back, and Lamar, the president, wants it looked into. In the meantime, a hot federal agent named Marybeth Medina, who's trying to push her storied past behind her, is trying to find Chris. I'm not going to pretend I know why, because it was all really hazy, but it has something to do with him being associated with some Afghans who were selling drugs or something? Yeah, as you can see, The Accountant isn't afraid to go ANYWHERE, regardless of how confusing it makes the story. Asperger's. Robotics companies. Afghan drug lords. Hit men. Anyway, when Chris and Dana's investigation starts turning up accounting inconsistencies, they become disposable targets. Somebody doesn't want them figuring out where that money went. So they go on the run, forcing Chris and Dana to spend a lot of time together. The two get to talking, and waddaya know? For the first time in his life, Chris starts connecting with someone. This is a big deal because he's autistic! Luckily for Chris, the bookish but lively Dana loves guys who don't make eye contact and engage in really awkward conversations. They're perfect for each other. Now if Asperger's, robotics, Afghanistan and hit men aren't enough for you, how 'bout I throw in a side of Delta Force?? Yes, ex-Delta Force member Brax is called on to hunt down Chris and get rid of this accountant mess once and for all. But when he finally finds Chris, it leads to a shocking conclusion that will.....um...conclude shockingly! Oh boy. I want to be nice here but this script is all over the place! From the very first page I was having trouble figuring out what was going on. The writing style alone is confusing, with every paragraph containing tons of "..." and "--." Just the way things were laid out made reading a challenge. For example, on page 6, we have someone named Frank (who we haven't been introduced to yet by the way) start talking off-screen: "I know people think farmers make all sorts of money, what with food prices so high... but between insurance, fertilizer costs..." The next line, an action line, reads: "A nameplate reads "Christian Wolff, CPA." Huh?? What nameplate? Where?? So we're going from a disembodied dialogue chunk from someone we haven't met yet to a character intro via a mysterious nameplate that as far as I can tell is floating in mid-air. I went back and re-read this sequence 3 times and finally understood it, but I don't think anything in a screenplay should have to be read three times to be understood. The entire script was written like this. Clunky. It was never easy figuring out what was going on. I think the place where The Accountant really lost me though was when we found out Chris was also a hit man. Huh???? Why is he a hit man? What does that have to do with anything? It just seemed so random. And when you add randomness to clunkiness, you've pretty much killed your screenplay. If I were these writers, I would step back and simplify everything. The robotics company audit is a cool idea. All sorts of ways you could go with that. Explore that more. If you want to keep Chris autistic, which does make the character enticing for actors, that's cool, but make it more relevant. Put him in more situations where emotions are required to get out of tough situations - emotion being the one thing he's incapable of. But get rid of the Afghans and hit men, please. That's a completely different movie and just confuses everything. Unfortunately, because the writing was hard to read, the story was overloaded, and key choices (i.e. making the lead character autistic) didn't seem to be strongly motivated, I couldn't get into this at all. [x] What the hell did I just read? What I Learned: Beware the "Everything And The Kitchen Sink" screenplay. I see this often from writers in their first or second efforts, particularly if they're writing an action or thriller flick. They just throw EVERYTHING they can think of into the story, believing it will make it ultra-awesome, not realizing that when you throw too many big ideas into your script, they start competing with each other and, in turn, confuse the audience, which is exactly what happened here. This story needs to be majorly streamlined. Start with getting rid of the hit man!